1The Chairman of the Committee wishes to acknowledge his indebtedness to various members of his committee as follows: to Mr. Priest for a great mass of data, helpful criticisms and the suggestions drawn from his preliminary committee report of 1919 (not published, but copy may be borrowed from Bureau of Standards Library, Cf. J. Op. 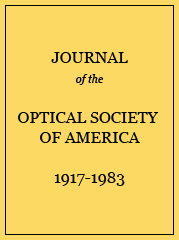 Soc., 4, p. 186; 1920); to Mr. Weaver for his elaborate computations of chromatic excitation values for many different classes of stimuli as well as for the development of the data upon which these computations were based; to Mr. Jones and to Dr. Ives for data and valuable criticisms. Adopted Mean I. E. S.
These values are for an equal energy spectrum. The relative magnitudes of the three elementary excitations have been chosen so that the curves for average noon sunlight have equal areas; that is, if the percentage values are plotted on a trilinear diagram, sunlight falls in the center. The absolute excitation values are based upon a convenient arbitrary unit. The percentage values are given for the red and violet only since those for the green can be found by subtracting the sum of the other two values from 100 in each case. All of the values in this table were calculated by means of Wien's equation with the exception of the last column, headed “5000x10-6“ and that was calculated by means of Planck's equation. The values show the correct relationships for different wave-lengths at a single temperature, and between different temperatures if multiplied by the factors which are placed at the heads of the several columns. See Forsythe, Ref. 19, pp. 330-331.
a Hyde, E. P. and Forsythe, W. E., Jour. Franklin Inst., 183, p. 354; Forsythe, W. E., Phys. Rev. (2), 17, p. 147, 1921; Priest, I.G., Color Temperature, Op. Soc. Am., Conv., Rochester, Oct., 1921, J. Op. Soc. Am., Jan., 1922. The first two columns show the lumens per watt and color temperatures as directly determined experimentally from a given lamp. The second two columns give these same quantities corrected for losses due to cooling effects of leading in and supporting wires and absorption of the lamp bulbs. a Hyde, E. P., Cady, F. E. and Forsythe, W. E., Color Temperature Scales for Tungsten and Carbon, Phys. Rev., (2), 10, Table I, p. 401; 1917.
a The values given in this table were supplied by Dr. H. E. Ives. Ives colorimeter filters measured at the Bureau of Standards depart appreciably from the above specifications, as do those examined by E. C. Bryant, Astrophys. J., 55, p. 9, 1922. Transmissions of Approved Photographic Taking Filtersλ=Wave-length in mμ.T=Fraction of incident radiation transmitted. a The numbers in column 1 show the spectral order of the thirty-six undiluted Ridgway chromas. Column 2 gives the names assigned to certain of the colors by Ridgway. Column 3 shows the wave-length of the dominant hue and column 4 the per cent. hue. Columns 5, 6, and 7 list the differences between succeeding members in wave-length, Steindler “hue scale,” and Jones “hue scale” units respectively (See Jones, Ref. 42, pp. 73–77). Percentage Color Excitation Values for Representative Monochromatic Analyses: Spectral Hues. There is an arbitrary factor in all of the above coefficients, so that the results are significant only as proportionalities. a “D” is the designation of the given color in the Munsell System and “E” is the corresponding percentage excitation value.